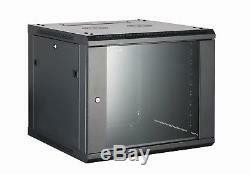 12U BLACK 550mm Deep 19 Wall Cabinet. This ALL-RACK 19 wall mount data cabinets are a 1.2mm mild steel construction. Each Data Rack comes with removable side panels and a glass front door, all lockable. They are supplied with depth adjustable heavy-duty steel mounting profiles to take industry standard 19 patch panels, switches and other equipment. The paint is a smooth finish light grey. The 550mm deep range are available in sizes 6u, 9u, 12u and 15u. If the product you require is not listed and for a full list of our comprehensive range of Free Standing and wall Cabinets and accessories please call our sales team who will be delighted to help you and even relist the item specifically for your requirements. There may be additional charges for some credit cards. Please retain the original packaging as this will be required. This must be displayed prominently on the package so we can identify your items. Any item that is damaged, incorrect or faulty we will arrange collection. ALLRACK WALL MOUNTED DATA CABINETS, RACKS. Allrack 19 wall mount data cabinets are a 1.2mm mild steel construction. Each wall mounted data cabinet rack comes with removable side panels and a glass front door, all lockable. The 450mm deep range are available in sizes 6u, 9u, 12u and 15u. We also supply the same heights of racks in depths of 550mm and 60mm deep. If the product you require if not listed and for a full list of our comprehensive range of Free Standing and wall Cabinets and accessories please call our sales team who will be delighted to help you. The item "12U Wall Rack BLACK 550mm Deep 19 Data Rack AV Rack used with PDU Patch Panel" is in sale since Thursday, July 3, 2014. This item is in the category "Computers/Tablets & Networking\Enterprise Networking, Servers\Racks, Chassis & Patch Panels\Rackmount Cabinets & Frames". The seller is "attocknetworks" and is located in Accrington. This item can be shipped to United Kingdom.